What does it mean to be Jewish? There are few more fundamental and difficult questions for Jews — indeed, figuring out one’s place within Judaism’s 3,000+ years of tradition, 620 commandments (plus a library’s worth of commentary), worldwide diaspora and multiple religious movements is itself key to many Jews’ self-identity. 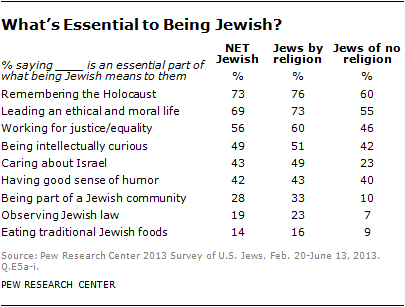 When we asked Jews about what is and is not essential to their own sense of Jewishness, 73% say remembering the Holocaust is essential (including 76% of Jews by religion and 60% of Jews of no religion). Almost as many Jews, 69%, say leading an ethical and moral life is essential, and 56% cite working for social justice and equality; only 19% say observing Jewish law is essential. While the rank order of results for Jews by religion mostly tracks that for Jews of no religion, there’s one clear exception: Caring about Israel is cited by 49% of Jews by religion but only 23% of Jews of no religion. 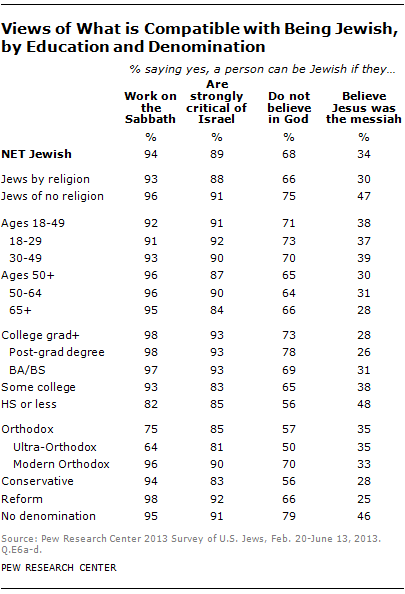 In general, Jews express fairly broad views of what is and isn’t compatible with being Jewish — majorities across all age and educational subgroups and in all major religious groupings say people can be Jewish if they work on the Sabbath, are strongly critical of Israel and even if they don’t believe in God.